Whenever I use our bamboo cutting board — which is nearly every single day, since we cook at home all the time – I can’t help but think about my friend Chrissy, who sent it to us as a wedding gift years ago. Now, I haven’t seen or spoken to Chrissy in like seven years. (I hope she’s okay!) But I literally think of her – just for a moment – almost every day. Because of a simple cutting board. Whenever I pour olive oil — again, something I do all the time — I think of my cousin Donna, who passed away several years ago. She gave us the lovely porcelain oil dispenser on our kitchen shelf. When I refill the salt shaker, I think about my pal Notte, who brought the traditional gifts of salt, wine, and bread to our housewarming party years ago. The wine and bread are long gone, but it’s taken us an awfully long time to plow through a whole pound of kosher salt! There are so many more, many of which are in the kitchen. Cooking chili reminds me of my brother, who gave me an awesome dutch oven pot. Our electric kettle conjures my Auntie Ciel, who bought us one for our wedding. It’s not even the same kettle anymore! That one burned out after about five years. Yet the effect lingers. There are also the gifts of knowledge passed along. 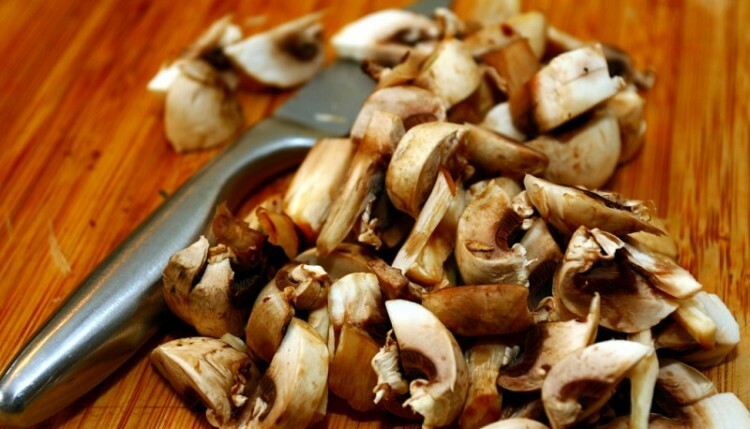 Anytime I cut the ends off mushroom stems – such a simple act! – I think of my friend Katrina, who taught me to do that in London almost 20 years ago. When I make a bechemel sauce, I think of Gloria, a former roommate from Spain who showed me the secret of the roux. And of course, I can’t get through “Leaving on a Jet Plane” or “The Boxer” without tearing up, remembering how my dad taught me to play those songs on my first guitar. Now, I’ll be honest: I don’t really know where I’m going with this, or what it all means. I don’t know if I’m just a more grateful than average person, or if other people experience the same thing. (Do you?) I don’t know why certain objects seem to generate this reaction while other just as important gifts (and gift-givers) do not. Gratitude is good. Studies show that people who take a moment each day to give thanks – to God, family, friends, luck, whomever or whatever – are happier people. “Gratitude is strongly and consistently associated with greater happiness,” a Harvard Health newsletter says. And I’ll be honest, there’s something to that: I spend a lot of mental energy thanking people and God each day, because I’m really pretty blessed, and I’m a pretty happy dude. My whole life, people have assumed I’m stoned or stupid or in on some joke because I’m always just smiling like a goofball, but the truth is I’m just pretty delighted to be here. Don’t assume that buying off the registry is lame. Many of these gifts were things we asked for, whether at point blank or through a registry. That can often feel like an uninspired cop-out, but it turns out, we use some of these things every day and they are constant, positive reminders of the people who gifted them to us. Kitchen items make great housewarming gifts. I don’t know why this seems to be the case, but a lot of those gifts center on cooking and the kitchen. It makes sense if you think about it: The kitchen is the heart of the house. It’s where the modern American family spends a lot of time, and the items within it get a ton of use. Want my advice? Get someone a nice cutting board or an awesome coffee maker they’ll use every day (not a disgusting K-Cup landfill machine, for God’s sake), and you will eventually be crowned Housewarming King and/or Queen. Teach somebody something worthwhile. Isn’t this the greatest, cheapest gift you can offer someone? Humans evolved to learn from others; it’s in our very nature to pass on information, person to person. I think about my favorite teachers – particularly Bill Drummond and Bob Thompson — literally ALL the time, and I was just one of many thousands of kids they made an impact on. Plants: Almost every plant in our house – even in our yard – has a story behind it. Plus, plants are fantastic at purifying the air and instantly warm up a room (this is a housewarming, right?). Make sure to get a low-maintenance house plant like a peace lily, aloe, or English ivy so the story has a happy ending! Memberships or subscriptions: A first-time homeowner will have lots to learn about maintaining their house. An Angie’s List subscription is a great way for them to find trustworthy tradespeople like plumbers and electricians for when a pipe eventually leaks. A membership at the Boston Building Resources Center will allow them to take awesome workshops and purchase donated building materials at a discount. And a subscription to This Old House Magazine – one of my favorite birthday gifts ever, from my wife a few year’s back – provides endlessly useful how-to’s and inspiration. A fully loaded toolbox: Every homeowner needs essential tools like a drill, hammer, and tape measure — and a sturdy toolbox to store them in. Whether you buy your new homeowner one of the big power tools, just the toolbox, or the whole shebang, they’re going to think of you every time they fix something. Got any other suggestions, or favorite gifts you’ve received? Tell me about them below! I love this post, Jon – lots of great ideas! I would also like to add that high quality food items, like the olive oil mentioned above, also make great gifts! We also loved your Post filled with thought provoking memories of gift givers when we use their gifts. We always think of you when we prepare our special “Barry” tea. It is the BEST, hands down, but the thinking of you guys who shared it with us is even better. Likewise, thinking of all the stories that come to mind when we look at favorite items in our house that were collected when traveling. One example is the Victorian Lady Bells displayed near our kitchen. I love reminiscing about where we were (mostly in London) when we collected each one. Guess those warm, fuzzy feelings are of love, gratitude and acceptance. We surely are blessed!! Thanks, Jon, for these reminders! !